This is not some sort of self-deprecating comment about my own blog. I just thought this was funny, especially in light of NaBloPoMo, wherein people post daily in November. In my experience, the quality of posting does not go up or remain static when people post daily. It goes down; the relationship between quality and quantity is inverse. If you want to create a daily writing exercise, do it in your own time. Don't clutter up my RSS feed. NaBloPoMo makes me take more people off of my blog reading list than anything else. The exception to this inverse relationship rule is for truly wonderful writers, where the quality of their posts remains fairly uniform and I am delighted to have more of their writing to read. But for the average-quality blog writer, who has mostly okay posts with a few brilliant flashes of insight every once in awhile that keep me coming back, daily posting does not endear them to me. P.S. What sort of bug would bite me twice on the inside of my elbow in November?! I've been wearing long sleeves--how did it even get to me? i have been so conditioned that i can only think of one answer to any question that starts "What sort of bug would bite me...," but I suspect/hope I am incorrect... ;) But how big are the bites? I think/hope they're too big to be what you're thinking of. They're like mosquito bites, or maybe a tiny bit smaller. And there are only two. I bet they're just mosquito bites from some mosquito that hasn't died off yet. I think most blog writers would agree that their blog - is just that - their blog. While most bloggers appreciate readers and commentators, at the end of the day they write for themselves. Readers should not determine what bloggers write about. It is a free country and if someone doesn't like the quality or subject matter on a blog - they are free to not read it. Part of owning a blog is the freedom to discuss serious issues as well as being silly sometimes. 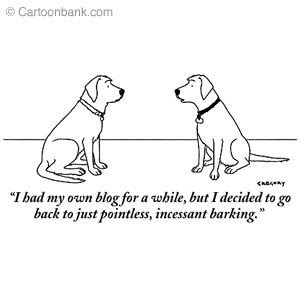 For most folks blogs are a way of reflecting our moods. Sometimes we will be very contemplative and insightful, other times silly and irreverent. Its like with human relationship, if you want to love us, you have to love all of us. But I hear what you are saying about the quality vs quantity. For the most part, unless someone is an incredible writer, frequency will decrease quality. Its sort of like my favorite TV shows. Some weeks the writers do an incredible job and some weeks - not so much. But I forgive them they are human and I will stick with the show because the good parts are worth enduring the bad parts. Whenever the ratio becomes reversed its time to drop the TV show or for that matter, the blog in question. mmm. i hope not too. just fyi, what i'm thinking abt are a bit bigger than mosquito bites, generally, and last longer. perhaps a super-mosquito indeed. Thanks for your comment. I think that readers should only determine what bloggers write about to the extent that the writers care what their readers want to read. Not ALL bloggers write for themselves exclusively or mostly. If they did, they would keep a journal or password protect their blogs. Since they don't, they obviously want people to read their blogs, and they probably care, at least a little bit, about what at least some of their readers think. They care less than other writers, though, since few bloggers rely on their writing for their livelihood, and few (no?) blog readers pay for the blog content that they read. The bar is lower all around. I don't think that an anonymous reader's relationship with an anonymous blogger is like other human relationships, in which "you have to love all of us." I don't write very much that's controversial or malicious, but if I did, I would expect some readers not to "love" that part of me. I certainly don't love some aspects of some bloggers that I read. As you said, they/I can stop reading it whenever they/I want--it is, indeed, a free country. "I don't think that an anonymous reader's relationship with an anonymous blogger is like other human relationships, in which "you have to love all of us." I don't write very much that's controversial or malicious, but if I did, I would expect some readers not to "love" that part of me. I certainly don't love some aspects of some bloggers that I read." Hmmm... I wonder if blog relationships are that different from other human relationships. Are there bloggers who you really enjoy reading who are malicious at times? I think like in real life when you meet someone malicious you stay away from them, unless you are trying to defend someone from them. Controversial is a very different issue. You wouldn't be friends with someone who is controversial if you liked them as a person or respected their stance? Don't you have friends in real life who on certain issues you strongly disagree but you are still good friends with them? Sometimes in the heat of an argument people say hurtful things both in real life and in the blogsphere. I don't think that is cause to end friendships. I think we need to allow people to be people and accept them even for the parts that we disagree with. Otherwise are we truly recognizing anyone?